Today’s “Yuhi” NAKAMURA (U. Tokyo, 2nd degree of Master course) and Yu-hi (meaning “the setting sun” in Japanese) were different from those till yesterday. Today’s Yu-hi (evening sun) lighted up the rear of well-organized precipitation clouds having 90 mm/day till this morning in darker red than usual. 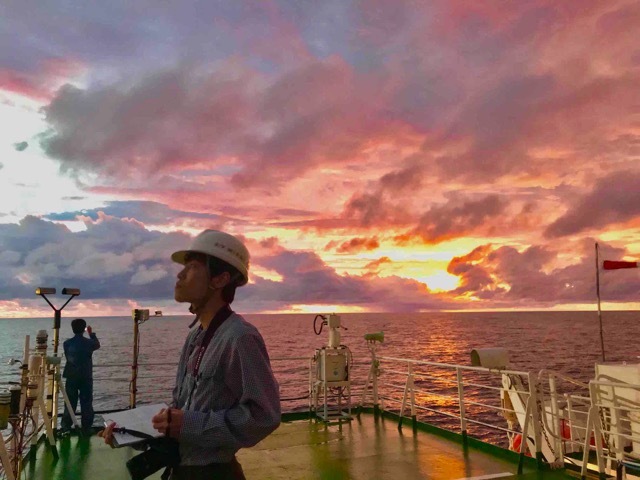 Today’s “Yuhi” (a good radiosonde operator) enjoyed the evening sky observation taking more time than usual because today was stopping hourly high frequent radiosonde operation and in usual 3 hourly one. Motesaku (strange as usual) was reporting.